The use of implantable cardioverter defibrillators (ICDs) has allowed an increasing number of young women to reach their reproductive years. The National Institute for Health and Clinical Excellence (NICE) guidelines suggest the "routine consideration" of ICDs for patients with repaired TOF,  which would lead to many more patients with repaired TOF having ICD implantation and presenting an unprecedented challenge to cardiologists, cardiac surgeons, obstetricians, and anesthesiologists. We present a young parturient with repaired TOF, severe dilated cardiomyopathy (DCM) and an ICD, who delivered her third healthy infant successfully by a cesarean section. We discuss the challenges encountered. A 24-year-old multigravida, height 154 cm and weight 46.1 kg, with a history of a surgically repaired TOF at the age of 2 years was admitted at 37 weeks of gestation for a planned cesarean section and tubal ligation. In spite of the doubts raised and an early offer of termination by therapeutic abortion, the patient and her husband chose to continue the pregnancy. Six years earlier, the patient had been diagnosed with severe left ventricular dysfunction and symptomatic nonsustained ventricular tachycardia for which a single-chamber ICD (Medtronic Marquis® 7230VR) was implanted in the left prepectoral region. During that period, the patient was in a stable and well-compensated condition and she discontinued the prescribed beta-blocker and angiotensin converting enzyme inhibitors early before pregnancies due to precautions raised by the physicians. Five and three years prior to the present pregnancy, two babies (2.8 kg and 2 kg, respectively) were delivered vaginally and uneventfully despite counseling against pregnancy. She had an uncomplicated miscarriage a year ago. An extraction and reimplantation of shock leads after lead failure was performed after her second delivery. There was no significant family history of congenital heart disease or familial cardiomyopathies. During this pregnancy, she did not experience any arrhythmic episodes or symptoms of heart failure decompensation. The management was maintained through frequent antenatal physical and echocardiographic examinations and measures focused on maintaining a low-salt diet, treating anemia with iron and vitamins supplement, limiting strenuous physical activity, and adequate rest. On this occasion, she was admitted with dyspnea on exertion (functional cardiac capacity/New York Heart Association of Class II/III) with no other significant cardiac symptoms. Physical examination showed blood pressure 92/58 mmHg, pulse rate 68 beats/min, respiratory rate 20 cycles/min, and pulse oximetry 95.8% on room air with no signs of heart failure and was otherwise unremarkable. 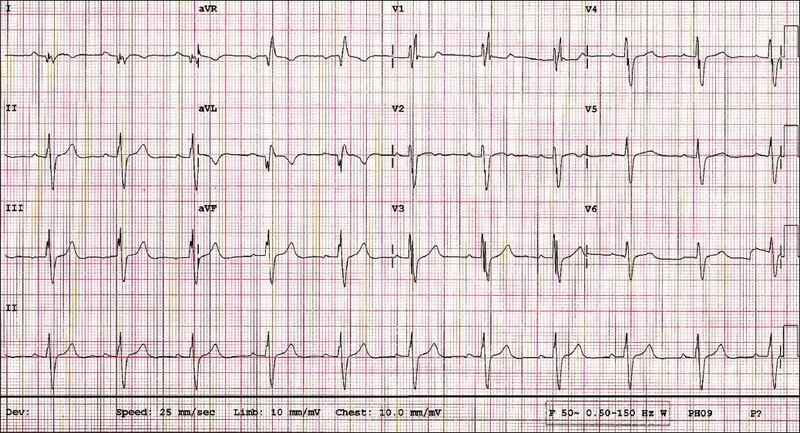 Electrocardiogram showed sinus rhythm and complete right bundle branch block [Figure 1]. 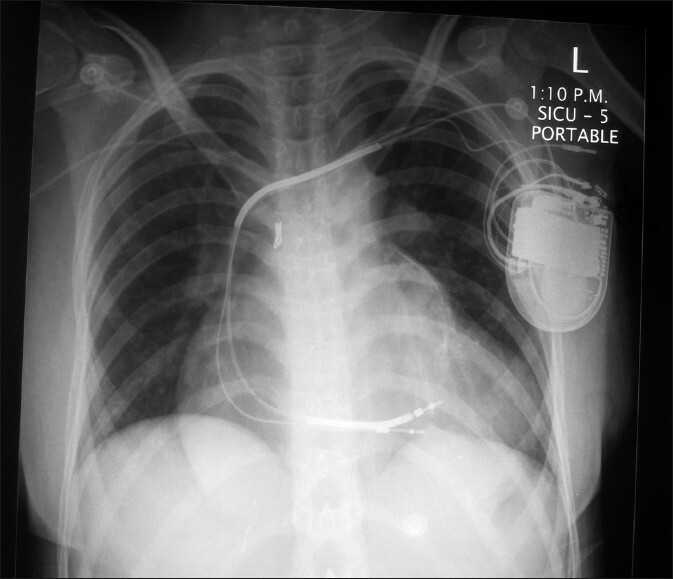 Chest X-ray showed previous sternotomy wiring, cardiomegaly, and an implanted ICD device in the left pectoral region [Figure 2]. A repeated antepartum echocardiographic study showed no residual shunt at the ventricular septal defect patch, a dilated right ventricle with normal systolic function, and an ICD lead seen traversing the tricuspid valve toward the right ventricular apex [Figure 3]; right ventricle systolic pressure was 44 mmHg, left ventricular ejection fraction (LVEF) 30%, left ventricular end-diastolic diameter (LVEDD) 56 mm, moderate tricuspid regurgitation (jet area of 4.5 cm 2), and moderate pulmonary valve regurgitation [Figure 4]. During the antepartum period, a multidisciplinary team of cardiologists, cardiac surgeons, obstetricians and anesthesiologists prepared the patient to be admitted 3 days before the planned day of the cesarean delivery that was elected to minimize the physical stress of labor and to offer a more stable hemodynamics. The ICD was deactivated by a cardiologist upon arrival at the delivery suite. Infective endocarditis prophylaxis was recommended by the infectious diseases' team. The patient was brought to the operating room with the pads applied and connected to an external defibrillator and a regular sinus rhythm was recorded by continuous electrocardiogram monitoring. Assisted ventilation and general surgical anesthesia was provided during the cesarean section with propofol, cistracurium, and suxamethonium. Fentanyl and morphine provided pain control analgesia. At no time during the uncomplicated lower segment cesarean section did maternal rhythm and hemodynamic status result in disturbances and the patient was extubated and recovered smoothly. The fetal status remained satisfactory during the operation and a healthy infant was delivered. The mother was transferred to the surgical intensive care unit and her ICD was reactivated postpartum. On the second postoperative day, she developed progressive dyspnea, tachypnea, and fever. Physical examination showed a temperature of 38.2°C, blood pressure 112/76 mmHg, pulse rate 120 beats/min, respiratory rate 40 cycles/min, and pulse oximetry 87.9% on room air. Chest examination showed bilateral coarse crepitation. Arterial blood gas values were pH 7.45, PaO 2 53 mmHg, PaCO 2 32.9 mmHg, and HCO 3 24.4. She was assisted with mechanical ventilation. A chest X-ray showed basal consolidation and computerized tomography of the chest confirmed bilateral basal consolidations with no evidence of acute pulmonary embolism. The d-dimer level was 159 mcmol/L (normal < 250 mcmol/L). After excluding pulmonary embolism, a provisional diagnosis was made of postoperative pneumonia and treatment with a combination of intravenous antibiotics (pipracillin and tazobactam) was started and continued for 2 weeks together with decongestive therapy and intravenous inotropes for transient acute pulmonary edema and hypotension. Serum levels of urea, creatinine, electrolytes, liver enzymes, and cardiac biomarkers were within normal limits; hemoglobin was 11.3 g/dL, white blood cells were 14.6 × 109/L; other blood indices and the coagulation profile were normal. C-reactive protein was 135 mg/L. Screening for viral hepatitis B and C was negative. Thyroid and adrenal hormone assays were normal. Repeated aerobic and anaerobic blood cultures produced no growth. Infective endocarditis was ruled out through transthoracic and transesophageal echocardiographic studies and repeated negative blood cultures. After 3 days of therapy, she showed signs of improvement, her fever subsided, she was extubated successfully, and no dysrhythmias were observed. Diuretic therapy was continued and she received subcutaneous enoxoparin for thromboembolism prophylaxis. Echocardiographic data before discharge showed no new findings and no signs of deterioration in the ventricular function or the pulmonary valve. She was discharged in a stable cardiac condition. Our patient was diagnosed with severe left ventricular dysfunction about 1 year before her primigravida but she remained stable and well compensated during pregnancy and had successful vaginal deliveries of her first and second healthy infant 5 and 3 years before this reported third pregnancy, respectively, despite counseling against pregnancies. Idiopathic DCM in patients with a repaired TOF or early during pregnancy has been described rarely,  although it clinically resembles peripartum cardiomyopathy that occurs in late pregnancy or in the puerperium. During the present third pregnancy, it was anticipated that the patient's condition might deteriorate with increasing dyspnea. Added to this, the magnitude of the hemodynamic changes in pregnancy increases as the pregnancy progresses. Therefore, after counseling, termination of the pregnancy was offered but was declined by the patient and her husband who requested that the pregnancy continue until the fetus had a good chance of viability. Management therefore aimed to optimize her cardiac status until the planned cesarean delivery and focused on dietary sodium restriction, treating anemia, and restricting her to bed rest. These measures are usually underestimated and when strictly applied some medication and adverse cardiovascular events might be avoided. With sodium restriction, the patient ran a relatively stable course and did not develop any pulmonary congestion or peripheral edema, and diuretics are usually used when sodium restriction alone becomes unsuccessful. Angiotensin converting enzyme inhibitors and angiotensin receptor blockers, which are part of the standard long-term therapeutic regimen in nonpregnant patients with heart failure due to systolic dysfunction, are contraindicated in pregnancy. Thus, the use of these agents in our patient was abandoned. Although beta-blockers are important components of the treatment, their use was hampered by borderline blood pressure. The use of vasodilator hydralazine is not routine and its use might be governed by clinical need, especially when the pregnant women are not hypertensive and have no evidence of congestion or decompensation. Digoxin might be added when symptoms persist despite diuresis and vasodilator therapy. Despite the fair clinical outcome of most adults with a repaired TOF, many patients have varying degrees of moderate pulmonary valve regurgitation which is usually rendered incompetent through surgical enlargement of the right ventricular outflow tract and insertion of transannular patches. In one report, severe pulmonary regurgitation was present in 14 pregnancies (28%), which led to complications in 3 (21%). One of those patients had a second pregnancy after pulmonary valve replacement without complications, while 8 (57%) of the patients with severe pulmonary regurgitation did not have complications during pregnancy. Our patient had moderate pulmonary regurgitation throughout all her pregnancies but this remained stable with no complications. One of the most perplexing issues in an adult with a repaired TOF is when to intervene and replace the pulmonary valve in the presence of significant volume overload secondary to pulmonary regurgitation. Although the operation has extremely low mortality,  the long-term pulmonary valve durability, ventricular function, longevity, and quality of life can be questioned. Although no lead fracture was reported in the 14 pregnant patients with ICDs studied by Natale et al.,  our patient, after her second delivery, needed new lead implantation, although this major concern of lead fracture could conceivably occur as a result of diaphragm elevation secondary to fetal growth and/or labor contractions increasing the stresses on the transvenous system. A cesarean section under general anesthesia was elected, and it is probably the preferred technique. It has the advantage of minimizing the physical stress of labor and allowing more stable hemodynamics; during general anesthesia, the cardiac output increases by 30% compared to 50% in spontaneous delivery but it is not free from hemodynamic consequences related to anesthesia, assisted ventilation, and the increased risk of thromboembolism. The incidence of the cesarean section was similar to that expected in the general population  although performed more often (28.3%) than in the Dutch general population (6.5%),  and this is in accordance with the report of Zuber and colleagues. The high rate of the cesarean section probably reflects caution or fear on the part of obstetricians and cardiologists. While the choice of anesthetic drugs may not be of prime importance, both general and regional anesthetic techniques need assiduous attention and have been employed successfully in parturients with a TOF. The optimum anesthetic technique for cesarean section patients with DCM is controversial and both general anesthesia , and regional anesthesia , have been described. Brown et al. described the use of general anesthesia because they feared catastrophic effects of a reduction in systemic vascular resistance caused by epidural blockade. Slowly titrated epidural anesthesia has been recommended as it avoids the use of cardiodepressant drugs and may improve myocardial performance by reducing the left ventricular afterload. , Mellor and Bodenham considered both methods dangerous and described the use of infiltration anesthesia supplemented with bilateral ilio-inguinal nerve block and intravenous fentanyl. We believe that close intraoperative and postoperative invasive monitoring may be more important than the choice of anesthesia. The presence of an ICD should not discourage women from becoming pregnant but the added functional cardiac status of a repaired TOF warrants meticulous handling of the patient starting from attention paid to the severity of pulmonary regurgitation, consideration of termination of pregnancy, to continuous close coordination through a multidisciplinary approach involving the cardiologist, cardiac surgeon, obstetrician and anesthesiologist, by means of which the most serious complications can be avoided. Continuous maternal hemodynamic and fetal monitoring at the time of delivery was another important aspect of meticulous care. Sepsis may be an underappreciated cause of worsening cardiomyopathy and proarrhythmia in this patient and early detection and treatment are of importance. Thromboembolism prophylaxis was anticipated during postpartum owing to the fact that both pregnancy and heart failure are independently associated with an increased risk of thromboembolic phenomena. Despite the hypercoagulable state of pregnancy, there are no data defining the risk of thromboembolic complications from ventricular thrombi in pregnant women with a severe LV dysfunction (e.g., LVEF < 30%) during the antepartum period. In our practice, we are not using anticoagulant prophylaxis during pregnancy when LVEF is ≥30%. Finally, a delivery in the case of a high cardiac risk parturient who did not comply with medical advice against pregnancy, although happily successful, is hardly a momentous event in the medical firmament. However, meticulous multidisciplinary care will be considered as core management of this particular patient. 1. Lotgering FK. Maternal cardiac disease and pregnancy. Fetal Matern Med Rev 1994;6:143-52. 2. Siu SC, Sermer M, Colman JM, Alvarez AN, Mercier LA, Morton BC, et al. Prospective multicentre study of pregnancy outcomes in women with heart disease. Circulation 2001;104:515-21. 3. Avila WS, Rossi EG, Ramires JA, Grinberg M, Bortolotto MR, Zugaib M, et al. Pregnancy in patients with heart disease: Experience with 1,000 cases. Clin Cardiol 2003;26:135-42. 4. Murphy JG, Gersh BJ, Mair DD, Fuster V, McGoon MD, Ilstrup DM, et al. Long-term outcome in patients undergoing surgical repair of tetralogy of Fallot. N Engl J Med 1993;329:593-9. 5. Nollert G, Fischlein T, Bouterwek S, Böhmer C, Klinner W, Reichart B. Long-term survival in patients with repair of tetralogy of Fallot: 36-year follow-up of 490 survivors of the first year after surgical repair. J Am Coll Cardiol 1997;30:1374-83. 6. Therrien J, Marx GR, Gatzoulis MA. Late problems in tetralogy of Fallot: Recognition, management, and prevention. Cardiol Clin 2002;20:395-404. 7. Roos-Hesselink J, Perlroth MG, McGhie J, Spitaels S. Atrial arrhythmias in adults after repair of tetralogy of Fallot: Correlations with clinical, exercise, and echocardiographic findings. Circulation 1995;91:2214-9. 8. Meijboom F, Szatmari A, Deckers JW, Utens EM, Roelandt JR, Bos E, et al. Cardiac status and health related quality of life in the long term after surgical repair of tetralogy of Fallot in infancy and childhood. J Thorac Cardiovasc Surg 1995;110:883-91. 9. Available from: http://guidance.nice.org.uk/TA95/guidance/pdf/English. [cited in 2010]. 10. Piper JM, Berkus M, Ridgway LE. Pregnancy complicated by chronic cardiomyopathy and an automatic implantable cardioverter defibrillator. Am J Obstet Gynecol 1992;167:506-7. 11. Isaacs JD, Mulholland DH, Hess LW, Albert JR, Martin RW. Pregnancy in a woman with an automatic implantable cardioverter defibrillator: A case report. J Reprod Med 1993;36:487-8. 12. Johnston AJ, Hall JM, Levy DM. Anesthesia with remifentanil and rocuronium for Caesarean section in a patient with long-QT syndrome and an automatic implantable cardioverter-defibrillator. Int J Obstet Anesth 2000;9:133-6. 13. Olufolabi AJ, Charlton GA, Allen SA, Mettam IM, Roberts PR. Use of implantable cardioverter defibril­lator and anti-arrhythmic agents in a parturient. Br J Anaesth 2002;89:652-5. 14. Marelli AJ, Mackie AS, Ionescu-Ittu R, Rahme E, Pilote L. Congenital heart disease in the general population: Changing prevalence and age distribution. Circulation 2007;115:163-72. 15. Singh H, Bolton PJ, Oakley CM. Pregnancy after surgical correction of tetralogy of Fallot. BMJ (Clin Res Ed) 1982;285:168-70. 16. Nissenkorn A, Friedman S, Schonfeld A, Ovadia J. Fetomaternal outcome in pregnancies after total correction of the tetralogy of Fallot. Int Surg 1984;69:125-8. 17. Hidaka Y, Akagi T, Himeno W, Ishii M, Matsuishi T. Left ventricular performance during pregnancy in patients with repaired tetralogy of Fallot: Prospective evaluation using the Tei index. Circ J 2003;67:682-6. 18. Lewis BS, Rogers NM, Gotsman MS. Successful pregnancy after repair of Fallot's tetralogy. S Afr Med J 1972;46:934-6. 19. Lo TF, Tan NC. Fallot's tetralogy and pregnancy: A report of a successful pregnancy after complete correction. Med J Aust 1971;2:141-5. 20. Veldtman GR, Connolly HM, Grogan M, Ammash NM, Warnes CA. Outcomes of pregnancy in women with tetralogy of Fallot. J Am Coll Cardiol 2004;44:174-80. 22. Mazor M, Levas E, Gussarsky Y, Friedman S, Leiberman JR. Idiopathic dilated cardiomyopathy in pregnancy. Arch Gynecol Obstet 1994;255:51-3. 23. Cheek TG, Gutsche BB. Maternal physiologic alterations during pregnancy. In: Shnider SM, Levinson G, editors. Anesthesia for Obstetrics, 3rd ed. Baltimore: Williams and Wilkins; 1993. p. 3-17. 24. Natale A, Davidson T, Geiger MJ, Newby K. Implantable cardioverter-defibrillators and pregnancy: A safe combination? Circulation 1997;96:2808-12. 25. Gillette PC, Garson A Jr. Sudden cardiac death in the pediatric population. Circulation 1992;85:I64-9. 26. Gatzoulis MA, Balaji S, Webber SA, Siu SC, Hokanson JS, Poile C, et al. Risk factors for arrhythmia and sudden cardiac death late after repair of tetralogy of Fallot: A multicentre study. Lancet 2000;356:975-81. 27. Bricker JT. Sudden death and tetralogy of Fallot: Risks, markers, and causes. Circulation 1995;92:158-9. 28. Jonsson H, Ivert T, Brodin LA, Jonasson R. Late sudden deaths after repair of tetralogy of Fallot: Electrocardiographic findings associated with survival. Scand J Thorac Cardiovasc Surg 1995;29:131-9. 29. Oechslin EN, Harrison DA, Connelly MS, Webb GD, Siu SC. Mode of death in adults with congenital heart disease. Am J Cardiol 2000;86:1111-6. 30. Witte KK, Pepper CP, Cowan JC, Thomson JD, English KM, Blackburn ME. Implantable cardioverter-defibrillator therapy in adult patients with tetralogy of Fallot. Europace 2008;10:926-30. 31. Page RL. Treatment of arrhythmias during pregnancy. Am Heart J 1995;130:871-6. 32. Brodsky M, Doria R, Allen B, Sato D, Thomas G, Sada M. New-onset ventricular tachycardia during pregnancy. Am Heart J 1992;123:933-41. 33. Brodsky MA, Sato DA, Oster PD, Schmidt PL, Chesnie BM, Henry WL. Paroxysmal ventricular tachycardia with syncope during pregnancy. Am J Cardiol 1986;58:563-4. 34. James DK, Stirrat GM. Pregnancy and risk: The basis for rational management. New York, NY: John Wiley and Sons; 1988. 35. Bais JM, van der Borden DM, Pel M, Bonsel GJ, Eskes M, van der Slikke HJ, et al. Vaginal birth after caesarean section in a population with a low overall caesarean section rate. Eur J Obstet Gynecol Reprod Biol 2001;96:158-62. 36. Zuber M, Gautschi N, Oechslin E, Widmer V, Kiowski W, Jenni R. Outcome of pregnancy in women with congenital shunt lesions. Heart 1999;81:271-5. 37. Roberts SL, Chestnut DH. Anesthesia for the obstetric patient with cardiac disease. Clin Obstet Gynecol 1987;30:601. 38. Brown G, O'Leary M, Douglas I, Herkes R. Perioperative management of a case of severe peripartum cardiomyopathy. Anaesth Intensive Care 1992;20:80-3. 39. Lavies NG, Turner DA. Periparturn cardiomyopathy: A rare cause of pulmonary oedema in late pregnancy. Anaesthesia 1989;44:770-2. 40. George LM, Gart SP, Lowe S. Peripartum cardiomyopathy: Four case histories and a commentary on anaesthetic management. Anaesth Intensive Care 1997;25:292-6. 41. Gambling DR, Flanagan MI, Huckell VF, Lucas SB, Kim JH. Anaesthetic management and non-invasive monitoring for Caesarean section in a patient with cardiomyopathy. Can J Anaesth 1987;34:505-8. 42. Mellor DJ, Bodenham A. Infiltration anaesthesia in the management of Caesarean section in a patient with peripartum cardiomyopathy. Anaesthesia 1996;51:409.